Rank tracking is as much art as science, and rankings can vary based on location, URL, language and date. Incorrect Rankings? Start here. What do I do when my SERP rankings appear to be inaccurate? SERP rankings can vary dramatically based on a variety of factors. Among other things, these factors can include personal browsing history, the time of day, and the geographic location where the search is being performed. 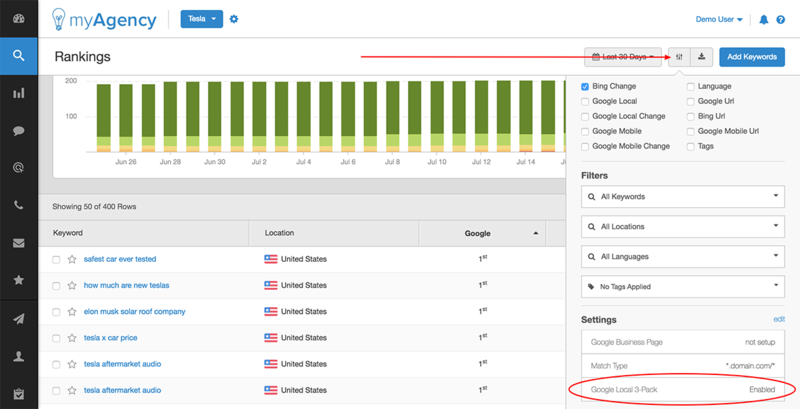 In addition, the precise settings that you have configured in your AgencyAnalytics dashboard can have a major impact on the way that SERPs are reported. If the rank that you're seeing in your dashboard doesn't match what you're seeing elsewhere, check these items first. 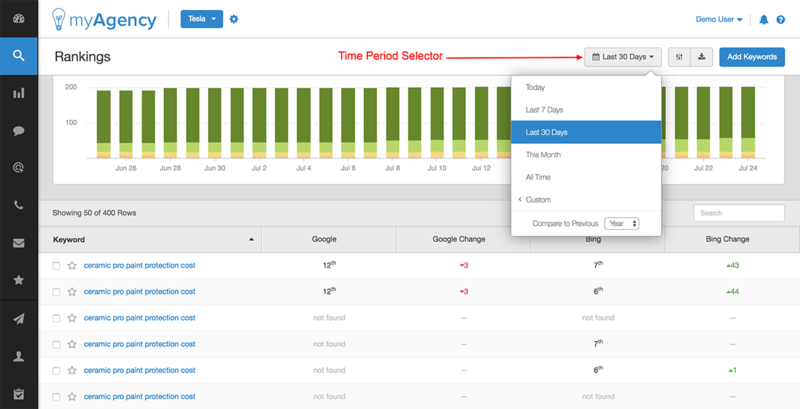 Is your dashboard date range set to a time period in the past? 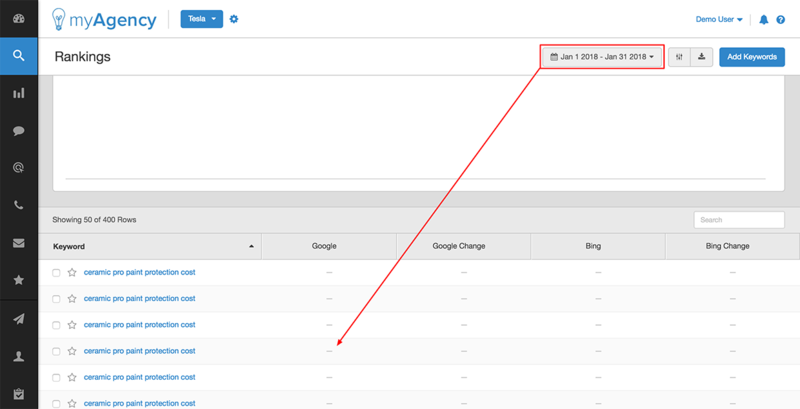 Like every other SERP tracker on the market, we're unable to fetch rankings for time periods before you actually added your keywords to our system. Check to make sure that you're viewing a time period AFTER you added keywords. (Read more about configuring dashboard time periods). A clue that you may be viewing a time period in the past is when you see dashes ("-") instead of numerical rankings or "not found" indicators. Are you tracking keywords from the correct geographic location? Geographic location can have a dramatic impact on SERPs. A site might rank at #1 for a given keyword in Detroit, but at #27 in Omaha. Verify that you're tracking the location that you intended by clicking the settings slider, and turning on the "Location" column. Learn more about location based SERP tracking in this tutorial. Have you checked your "Google 3-Pack" setting? This is one of the most common causes for results in our dashboard appearing to be inaccurate. 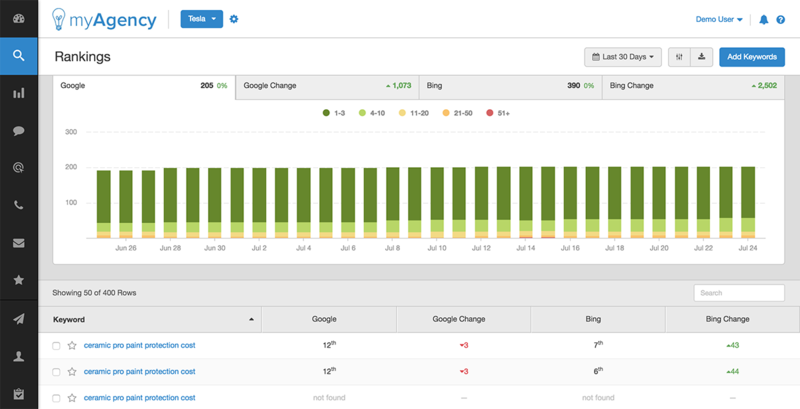 Customers typically have the Google 3-pack setting toggled to Enabled in our dashboard. But on their end, they're counting the SERPs as though they have the setting Disabled. Learn more about the Google 3-pack setting in this article. Note that when you change your Google 3-pack setting, the SERPs do NOT update immediately. Instead, they'll update at their regularly scheduled 24 hour refresh time. Are you tracking the correct campaign URL? Is there a typo in your campaign URL? Has the URL of your client's site changed due to a redirect or other factors? This article explains how to check the URL that's configured for rank tracking in your campaign. Have you connected a Google Business Page to the campaign? This applies mainly to Google Local and Google Mobile results. Google recently changed the structure of both their Google Local and Google Mobile SERPs. The SERPs no longer display the URL of most listings, instead displaying only the Google Business Page. As a result, our system has no way to know that the GBP in the SERPs is tied to the campaign URL configured in our platform. If you're seeing issues with Google Local and/or Google Mobile, and you haven't already connected a GBP, please do so by following these instructions. Note that, once you connect a GBP, your SERPs won't update immediately. Instead, they'll update at your normally scheduled 24 hour ranking refresh time. Are you controlling for personal browsing history and physical location when verifying SERPs? For the most accurate results, we recommend utilizing our SERP link for manual SERP verification. If you must verify SERPs outside of our platform, make sure that you're using a method that will prevent the Google algorithm from using your personal browsing history as a ranking factor, and that will emulate results from the same physical geographic location that you've configured in your rankings dashboard. Signing out of your Google account and/or using Google Incognito mode are NOT accurate rank tracking methods. Incognito mode in particular was NEVER designed to be used as a rank tracking utility, and stopped being remotely useful for rank tracking purposes around 2014. Read more about the problems with using Incognito mode for SERP tracking here. The above methods allow Google to easily tie you to both your personal browsing history and your physical geographic location via your IP address. We cannot accept any ranking comparisons that use these methods. Click here to learn more about how AgencyAnalytics fetches accurate SERPs from a technical standpoint. Is SERP volatility high today? Either for Google as a whole, or for your particular keywords? Our rank tracker fetches rankings exactly once every 24 hours. If there's a high degree of volatility in the SERPs, rankings can vary when checked even a few minutes apart. When this is the case, it's unlikely that the SERPs fetched at our 24 hour cycle will match the live SERPs. You can check to see whether Internet-wide Google SERPs are more volatile than usual (normally indicating that an algorithm update is being rolled out) via the Mozcast utility. If you've just begun SEO work, or have been engaged in a high intensity SEO campaign, that can cause localized SERP volatility for your specific keywords. Volatility in either of these cases normally settles out after a few days. Certain niches that are extremely competitive tend to be perpetually volatile, making it difficult to impossible for us to provide accurate results on a 24 hour ranking refresh cycle. These niches include the legal industry, plastic surgery, gambling, and others. What if you've checked all of these factors, and your SERPs still don't look right? Feel free to reach out to our support team from within your AgencyAnalytics account. Be prepared to provide us with examples of campaigns and keywords where you're seeing the issue, and to explain in detail the exact methods that you're utilizing to verify the rankings outside of our system. Click here to learn more about how our system fetches accurate rankings from a technical standpoint.